How Does an 802.11ax AP Allocate OFDMA Resource Units? In the previous blog, you learned that 802.11ax access point uses OFDMA technology to partition a channel into smaller sub-channels called resource units (RUs) so that simultaneous multiple-user transmissions can occur. The AP mandates the RU allocation of a 20 MHz for multiple clients for both downlink and uplink OFDMA. RU allocation information is communicated to clients at both the PHY and MAC layers. At the Physical layer, RU allocation information can be found in the HE-SIG-B field of the PHY header of an 802.11 trigger frame. The HE-SIG-B field is used to communicate RU assignments to clients. As shown in Figure 1 the HE-SIG-B field consists of two sub-fields: the common field and user-specific field. A sub-field of the common field is used to indicate how a channel is partitioned into various RUs. For example, a 20 MHz channel might be subdivided into one 106-tone RU and four 26-tone RUs. The user-specific field comprises multiple user fields that are used to communicate which users are assigned to each individual RU. What about how RU allocation information is communicated at the MAC layer? RU allocation information is delivered in the user information field in the body of a trigger frame. 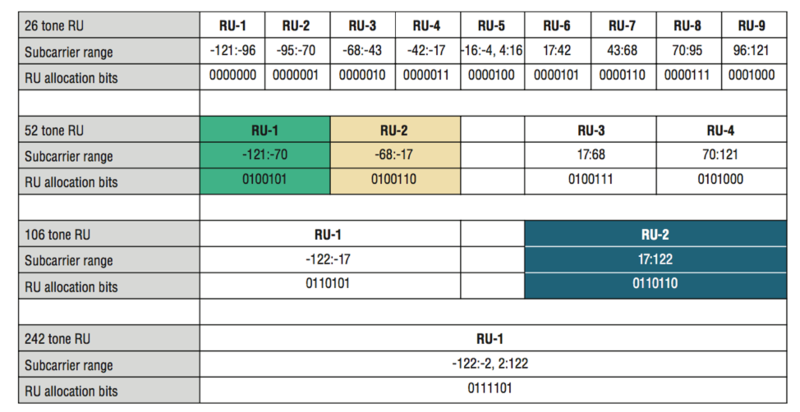 Figure 2 displays a table of how RU allocation information is communicated at the MAC layer. The table highlights all the possible RUs within a 20 MHz channel and the subcarrier range for each RU. Each specific RU is defined by a unique combination of 7 bits within the user information field of the trigger frame, known as the RU allocation bits. In the example, in Figure 3, the trigger frame allocates specific RUs to three client stations for simultaneous uplink transmission within a 20 MHZ OFDMA channel. 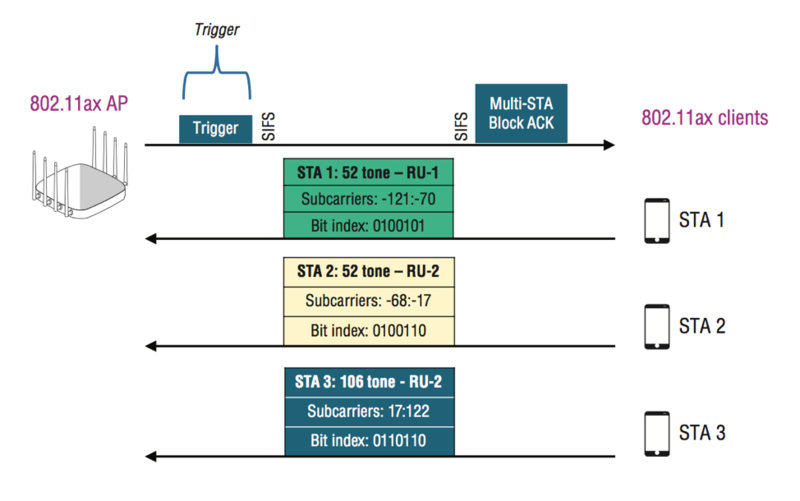 Clients STA-1 and STA-2 are each assigned to a 52-tone RU, whereas client STA-3 is assigned to a 106-tone RU. Please check back every week and read future 802.11ax blogs, where we will discuss in more detail the mechanisms of ODMA including the use of trigger frames for both downlink OFDMA and uplink OFDMA.